£400 Off Flights with Cruise Bookings at Princess Cruises - Mexico, Canada, Hawaii & More! £200 Off 12-Night British Isles Cruises from Southampton at Princess Cruises - Now £799pp! First setting sail in 1965 with a trip to Mexico, today, Princess Cruises boasts an exceptional fleet of 17 beautiful ships to take you around the world in style. From the Royal Princess ship to the Crown Princess and Diamond Princess Ship - each stunning vessel is filled with comfortable accommodation, delightful dining options and wonderful entertainment to let everyone have a swell time. From freshwater pools and hot tubs, to sports courts and nighttime entertainment - there is everything and more to help you unwind and refresh. With plenty of activities to entertain families with teens and kids too - from stage performances, to music and dancing - everyone will feel enlightened with the array of things to do on a Princess Cruise. This is your chance to go worldwide, with over 150 routes and itineraries to choose from, the travel possibilities are endless with Princess Cruises. Sail to over 6 continents, to Europe, South America, Hawaii, the South Pacific and many more exotic destinations. When you can combine your cruise with land tours and sightseeing at each stop too - you'll be sure to tick many an incredible experience off your bucket list! With favourite TV host, Phillip Schofield now the proud brand ambassador for Princess Cruises, every trip is guaranteed to get your seal of approval too. If you're a first-time cruiser and need a little guidance on what to pack or how much luggage to take - you can refer to an FAQ section online that is plentiful of indispensable information to ensure that you have a sound trip, starting from the onset. With a bountiful destination list to choose from, don't wait to indulge in an unforgettable experience with Princess Cruises. How do I use Princess Cruises discount code? Continue to complete your booking. You can sign up to receive special offers and to access limited time deals on cruises galore with Princess Cruises from the home page. Are there any discounts for Military personnel at Princess Cruises? Indeed, to thank those who have served in the British Armed Forces, Princess Cruises offers a Military Cruise benefit programme, full of exceptional advantages to enjoy your cruise furthermore. Can I order a Princess Cruises brochure? Yes, simply order a Princess Europe brochure online to receive your free copy. How does Princess Cruises refer-a-friend work? If you’ve been a guest with Princess Cruises, by inviting a friend who has yet to set sail, you’ll both receive a reward should your friend decide to make a reservation. You should receive a confirmation via email of your booking, which you will also be able to access online. Be sure to contact Princess Cruises or your travel agent should you wish to cancel or amend your trip. Call Princess Cruises on 0344 338 8663 or email support via the contact page. 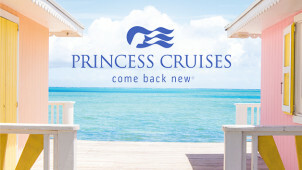 For a truly original and luxurious way to travel, let yourself be swept away by Princess Cruises. This cruise liner is world-renowned for its beautiful fleet of ships to romance and entertain everyone that hops on board. Discover a new way to explore the world, and with Princess Cruises discount codes you’ll save on an experience of a lifetime. Whether you board the Golden Princess ship to Australia, or take a trip to the Mediterranean on a Crown Princess ship - there will be a cruise to suit your every dream adventure perfectly. You can completely personalise your cruise holiday even further with the soon to launch, Ocean Medallion. Innovating the already tailored service that you’ll receive on every Princess Cruises' trip, this will let you create a getaway to remember. Wear your complimentary Ocean Medallion as a pendant, clip, wristband or even just tucked in your pocket and you’ll have a Cruise guide by your side at all times. Letting you access concierge style guidance on the move - now you can streamline your experience with a sea of possibilities and make your trip extra special. Hopping on board the Crown Princess cruise ship is always a delight, especially when you can save on luxury using the Princess Cruises promo code from us. With plenty of dining options to indulge every taste, world-class entertainment and beautiful accommodation options too so that everyone can enjoy a rejuvenating night’s sleep - this is a wonderful way to see the sights of the world while you travel like a VIP.